Plans for a student recreation center could imperil old UH buildings. 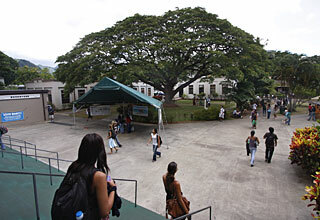 This is the view of the Engineering Quad as seen from the Campus Center on the UH campus, which includes the former Engineering Materials Testing Laboratory, the second-oldest building on campus; the building that houses the UH campus paper Ka Leo; and the large monkeypod tree in the middle. The tree and courtyard are not affected in the plans. Are you ready for the next tech disaster?